The legendary godfathers of traditional doom, SAINT VITUS, announce they have wrapped recording of a new, as-yet-untitled, studio album. The follow-up to 2012’s ‘Lillie F-65‘ will arrive in 2019 via Season Of Mist and will be the band’s first album with original vocalist Scott Reagers since 1995’s ‘Die Healing‘. To promote the new disc, SAINT VITUS will embark on a European tour in April 2019. Support on the trek is to be provided from Dopelord, also featuring Telepathy on select dates in Switzerland and Italy. It is uncertain if bassist Mark Adams will participate on the run, as it was revealed in October that he is suffering from Parkinson’s Disease. 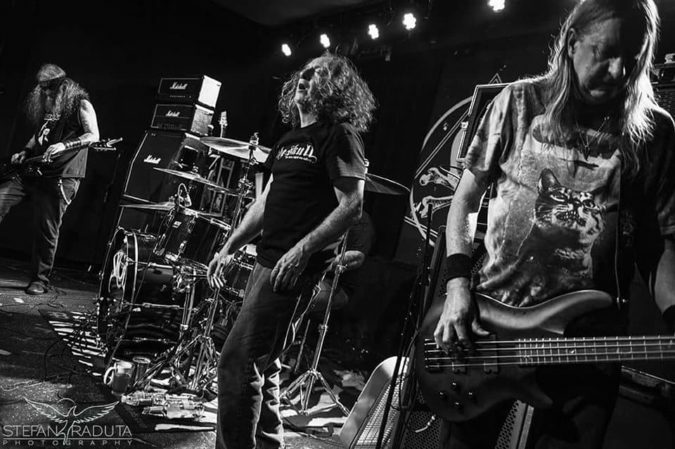 Adams has been absent from recent live performances, with current DOWN / former Crowbar bassist Pat Bruders filling in for him. A GoFundMe campaign to assist with Mark’s medical expenses has been launched. If you would like to donate to help out, visit the page [HERE].